All Information is Entered Once in this Screen-then Various Reports can be Generated. Information is Saved & Sorted Automatically. There is a Date Calculator providing accuracy of Date Entered. Location is the Section in the Chart & Narrative is the Pertinent Information from The Medical Record. Add LNC Note & Comments and References as needed. Timelines can be created when entering your Chronology. You can enter Summary Notes. 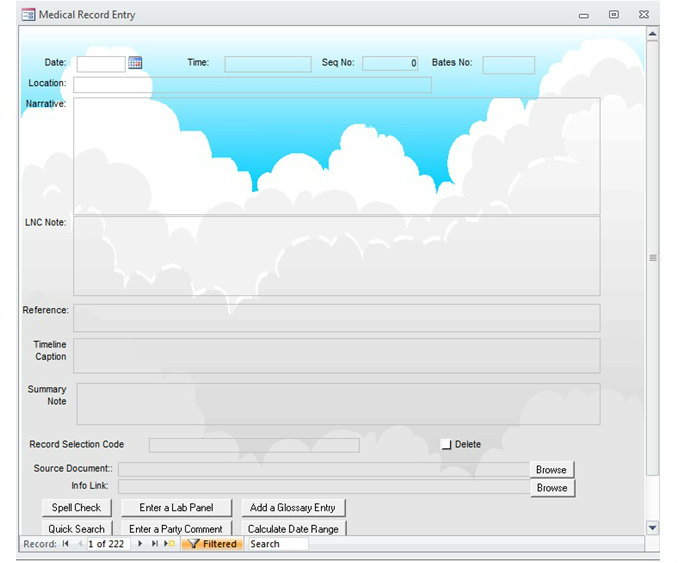 Record Selection Code will allow you to Tag Records for Special Reports. Delete button will remove an entry if desired. You are able to "Browse" to your on Files & review Scanned Medical Records. Create Charts & Graphics, List of Players, Deposition Questions, Glossary from the Chronology Screen. There is even a Date Range Calculator.